The Crescent Nebula is an emission nebula situated about 5,000 light years away. It lies in a patch of Milky Way that runs right through Cygnus, the Swan. The richness of the Milky Way in this region is apparent from the vast number of stars in this image. 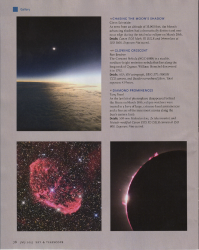 The image actually looks grainy due to the very faintest stars in the background. 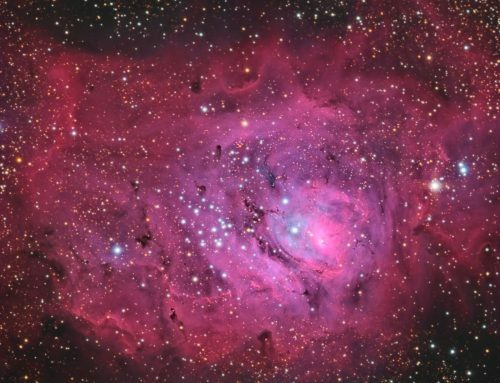 The red hue of the nebula and the surrounding area is due mostly to glowing hydrogen gas. 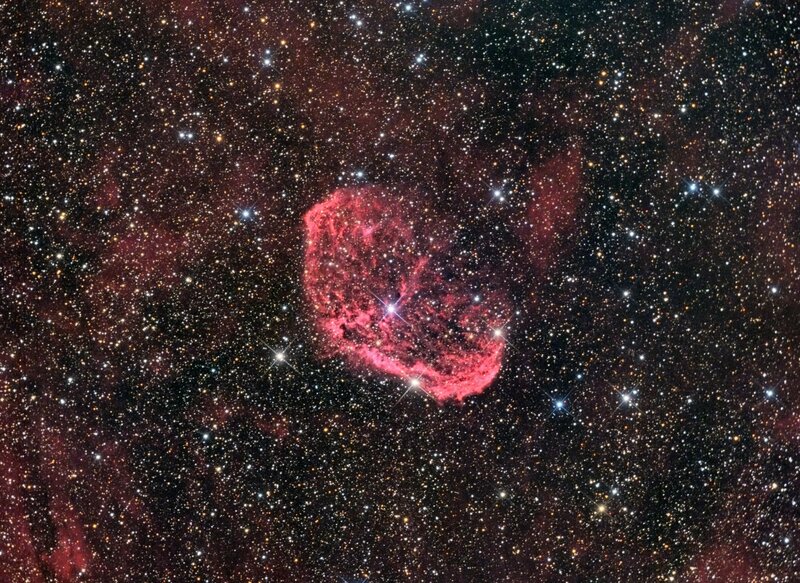 The Crescent Nebula is being energized and “blown out” by energetic winds coming from the powerful central star, WR136. The WR signifies that it is a “Wolf-Rayet” star — very hot, at least 20 times the mass of the sun, and losing mass rapidly. I read that WR136 is shedding the equivalent of the Sun’s mass every 10,000 years and that it will eventually explode in a supernova! That will probably produce another very interesting nebula for our descendants to look at! 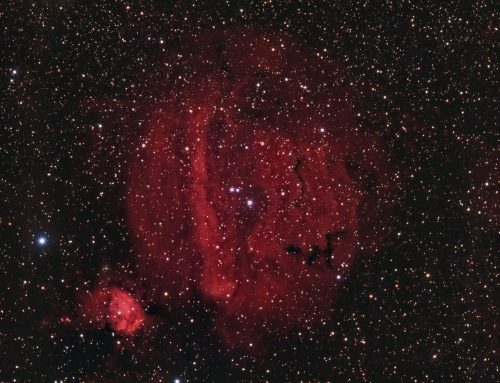 SBIG STL-11000M camera, Baader RGB and Ha filters, 10″ f/6.8 ASA astrograph, MI-250 mount. Guided with STL-11000’s external guider and 400 mm f.l. guide scope. Focusing with FocusMax. Acquisition, guiding and calibration with MaximDL. Cosmetic Correction, registration, integration and all processing in PixInsight. Shot from my SkyShed in Guelph, Ontario. No moon Average or better transparency and average seeing. 17x10mHa, 9x5m R, 9x5m G, 6x5m B, all unbinned (Total 4hr50m). Deconvolution: A star mask was made to use as a local deringing support. A copy of the image was stretched to use as a range mask. Regularized Richardson-Lucy Deconvolution was applied (75 iterations, external PSF made using DynamicPSF tool with about 30 stars). Ha, R, G and B masters were cropped to remove edge artifacts from stacking. The R, G and B channels were combined to make an RGB image. Ha and RGB were processed with DBE, ColourCalibration was applied, and the Ha and RGB were combined with the NB-RGB script. HistogramTransformation was applied using autostretch settings from ScreenTransferFunction. 4. Use LRGBCombine to apply SynthL to the HaRGB image. Noise Reduction and Re-Stretch: TGVDenoise was applied in Lab mode with 300 iterations with a range mask used to protect nebula and stars. This was followed by a HistogramTransformation to raise the black point (but with no clipping). Star Reduction and Colour Adjustment: Morphological transformation (3×3, 4 iterations, strength 0.15) was applied using a star mask to protect background and nebula. Luminance was extracted from the image and LinearMultiscaleTransform was applied to extract the first 4 wavelet layers (no residual). This image was used as a mask when applying ColourSaturation to boost colour in the star cores. Final Steps: Curves was applied to adjust saturation and contrast.